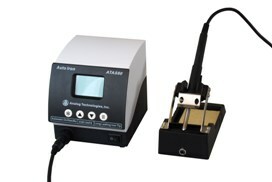 The soldering iron ATAS80 is a kind of hand-operated tool used for electronic soldering. Melting the solder (usually tin wire) by supplying heat to the solder, then the two work pieces will be welded together. With many features, this auto soldering iron station is an advanced soldering equipment in the scientific experiments or electronic products manufacturing.